The Optimus MA220 is a combination high performance GPS-GLONASS and 2G/3G/4G LTE (plus GSM /CDMA/PCS/ DCS/UMTS/GPRS/EDGE/HSPA) antenna to simplify Automotive Telematic and Fleet management systems worldwide. Its high quality low profile covert housing can be attached onto the glass or even out of sight under the dashboard. 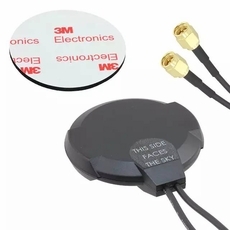 This combination of a high gain GPS/Glonass antenna and a LTE antenna is ideal for those applications that require durability, small size and covert installation, and reliable reception and transmission crossing through different mobile networks. The LTE cellular antenna function covers all main LTE and 2G/3G cellular bands worldwide. It has been designed to work equally well when mounted on glass or on plastic. It is not suitable for mounting on metal. The GPS/Glonass function means increased accuracy and reliability of location. A front-end SAW protects the LNA from burnout by nearby out of band cellular transmissions and also significantly reduces any compression and consequent reduction of sensitivity. The standard version has 3 metres RG174 cable and SMA(M) connector on both GPS/ Glonass and LTE. For even higher gain and efficiency we recommend if you can to use shorter cable lengths, as shown in the charts below. The cable lengths and connector types are completely customizable according to customer request, subject to a minimum order quantity. The slim housing is fully IP67 waterproof. A separate automotive approved 3M adhesive pad is provided, allowing the antenna to be mounted correctly facing through glass, or directly onto a plastic surface like the dashboard of a vehicle. Note if US LTE network certification is required contact Taoglas for advice on correct antenna choice.